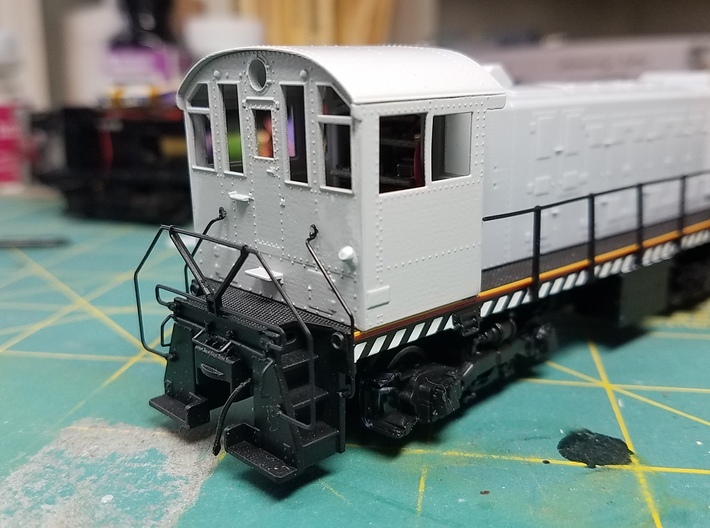 When the New Haven Railroad ordered Alco S2 switchers the railroad specified a low profile cab instead of the standard cab. This cab is designed as a kit to replace the standard cab of the new Atlas S2. This cab was designed from low profile cab elevation drawings found in NHRHTA Shoreliner Vol. 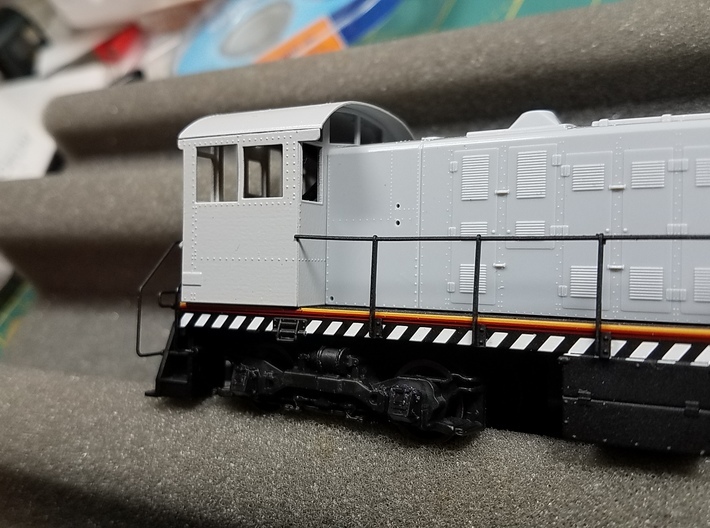 35 Issue 1 and other photos of New Haven S1s and S2s from various sources. 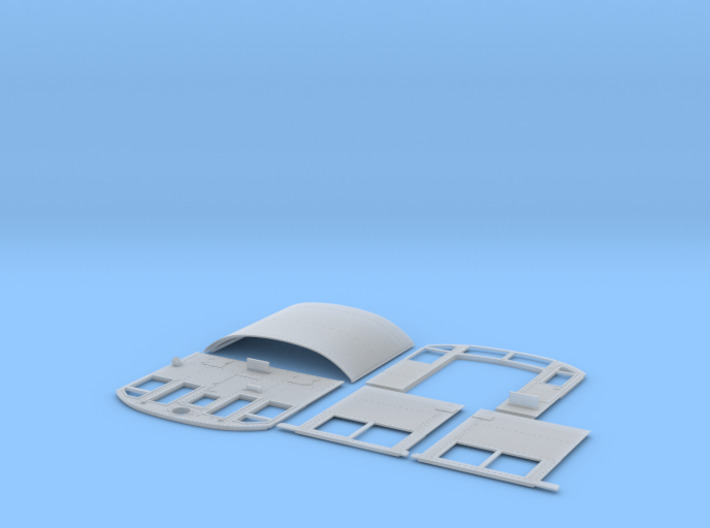 This cab was designed to be printed as a five piece flat kit with all the visible surfaces of the parts oriented to maximize the detail during the 3D printing process. Shapeways Frosted Extreme Detail material should be specified for best results. Shapeways recently changed the name of this material to Smoothest Fine Detail Plastic. The parts have some striations on what should be smooth surfaces due to the current limitations of 3D printing. 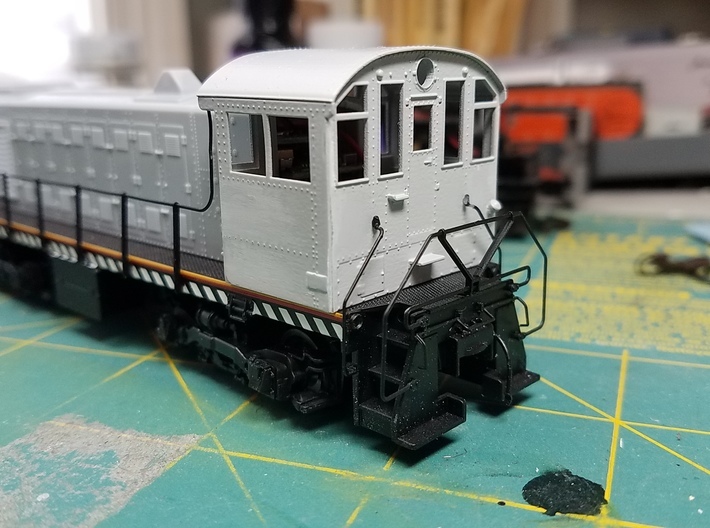 The parts can be primed with a primer containing fillers like Mr. Primer Surfacer 1000 or Tamiya Fine Surface Primer to make the surfaces smoother. Alternatively, the surfaces could be sanded smooth and Archer rivets applied to replace the rivets removed while sanding. There are mitered joints at the four corners of the cab. The cab roof is designed with a thicker portion inside the cab that forms joints with the inside of the front, back and sides to align it properly during assembly. There are recesses in the front, back and sides to allow installation of clear window material closer to the external window frames for a "closer to flush" appearance. It is suggested the window material should be cut to fit the recesses before assembling the cab. 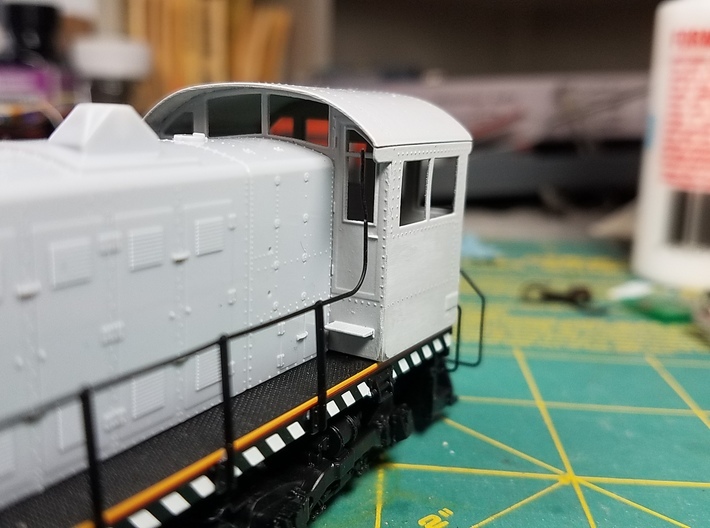 The window material for the two windows over the hood on the cab front need to be trimmed at the top to allow room for the portion of the roof that is thicker inside the cab. 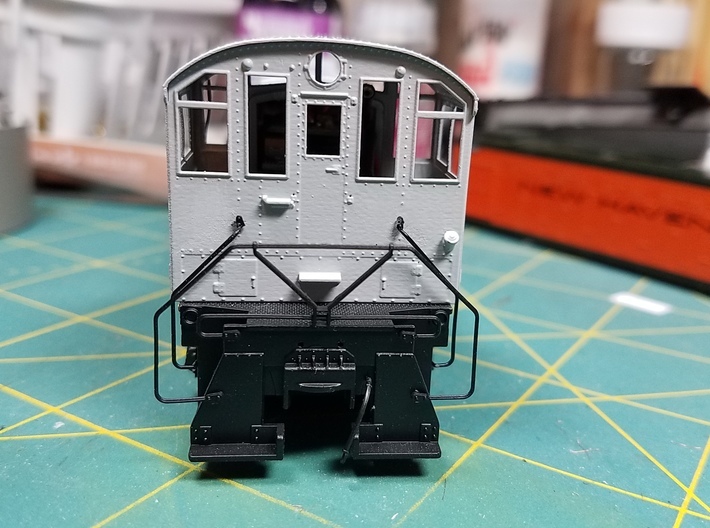 Once the cab is assembled and painted the window material should be applied using canopy cement. 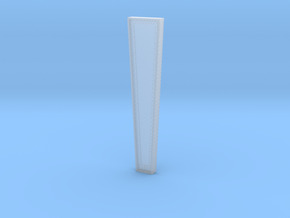 A set of 0.010 clear styrene windows has been designed in 2D vector graphics to allow them to be cut by a Cricut machine. Please contact me directly to order window glazing sets for $5 including shipping. The parts should be cleaned before assembly to remove any waxy support material. The parts can be cleaned in an ultrasonic cleaner with a few drops of Simple Green, followed by a rinse with clear water. The cab can be assembled using CA along all joint lines from the inside. The parts need some light sanding to remove surface roughness to make a good fit where they are joined. Assemble the cab back to the cab sides using a Coffman Mini Right Clamp with some small strip styrene spacers on the back of the sides to hold the parts square. Then add the roof and finally the cab front. The Atlas S2 angled handrails from the back of the cab to the steps can be installed on this cab by drilling #73 holes in the cab back at the proper locations. The handrails on either side of the door on the back of the cab should be formed from 0.016 inch brass wire. 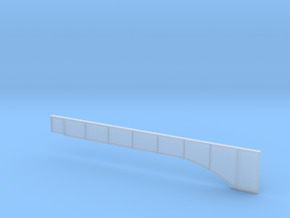 A handrail bending jig has been recently added to ease bending of the rear handrails. The jig must be purchased separately. The rear light is sized for an MV clear lens #136. The New Haven substituted brass three-chime whistles instead of standard diesel horns. A Custom Finishing #103 whistle can be used.